John Adams was the 2nd President of the United States who served in office from March 4, 1797 to March 4, 1801. What was the life of John Adams like? The short biography of President John Adams covers important information and facts about his early life, his family, career and the famous events and achievements of his political life. Our short biography of John Adams provides an interesting and easy way to learn about the life of the President. The following important facts provide a fast overview of important facts about President John Adams. Facts and Info: John Adams was the first Vice president and the second president of America. He is highly regarded as one of the most influential Founding Fathers of the United States. For additional info refer to 20 Facts about John Adams. Facts and Info: He was born on October 30th 1735 in Braintree, Massachusetts. John Adams was the great-great-grandson of John and Priscilla Alden, Pilgrims who landed at Plymouth Rock in 1620. His father was a farmer and cordwainer (a maker of leather goods) who also served as a church deacon. John had 2 brothers Peter and Elihu. Elihu died during the American Revolution. John Adams died on July 4th 1826 in Quincy, Massachusetts. Facts and Info: The career of John Adams included the roles of a Lawyer, Diplomat, Politician and Statesman. He advanced to the position of Vice president serving under George Washington from 1789 to 1797. He became the 2nd president of America in 1797 and served for 4 years until 1801. Facts and Info: John Adams married Abigail Smith on October 25, 1764. They had 5 children whose names were Abigail Amelia, John Quincy, Susanna, Charles and Thomas Boylston. The Adams' were the first residents to live in the Executive Mansion, later called the White House. The first child to live in the White House was their four-year-old granddaughter, Susanna. His son, John Quincy Adams, was destined to become the 6th president of the US. Facts and Info: John Adams belonged to the Federalist Political Party. He was 61 years old when he was inaugurated as the 2nd president. Thomas Jefferson stood as the Vice president. In 1800 the White House became the official home of American president. John Adams and Thomas Jefferson both signed the Declaration of Independence prior to being elected as presidents of America. For additional facts refer to his Presidential Cabinet members. Short Biography of John Adams: What he was like! Facts and Info: John Adams had a slight figure standing at 5 feet 7 inches. His color was unusually high, his face was often red from exertion & his blue eyes blazed. He was well knit, muscular, and quick and sure in his movements. Facts and Info: During his lifetime he played a key role in important events of the era notably the XYZ Affair and the naval Quasi-War with France. John Adams was instrumental in exposing the XYZ affair, providing Congress with letters from the peace commission indicating French efforts to bribe and intimidate U.S. officials. The Alien and Sedition Acts of 1798 and the Virginia and Kentucky Resolutions were also important events during his presidency. 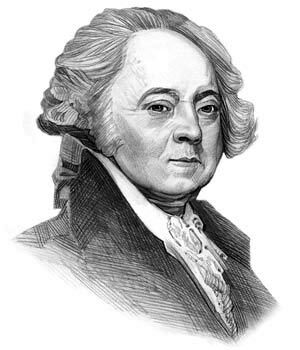 Facts and Info: During his life John Adams suffered from respiratory infections and depression. When he was young he was inoculated against smallpox and spent three weeks in the hospital, suffering headaches, backaches, knee aches, gagging fever and an eruption of pock marks. As he aged most of his teeth fell out but he refused to wear dentures & therefore talked with a lisp. Facts and Info: John Adams was 90 years old when he died of heart failure and pneumonia on July 4, 1826 in Quincy, Massachusetts. He was buried in the family crypt beneath the United First Parish Church. Coincidently, John Adams and Thomas Jefferson died within a few hours of each other on the 50th anniversary of the signing of the Declaration of Independence, July 4, 1826. The short biography of John Adams provides a fast overview of the key facts and events about his life and the accomplishments of his presidential term in office. The following John Adams video enables you to sit back and listen to the history of his personal and political life - a useful educational resource for kids, children and schools learning about the life of President John Adams.